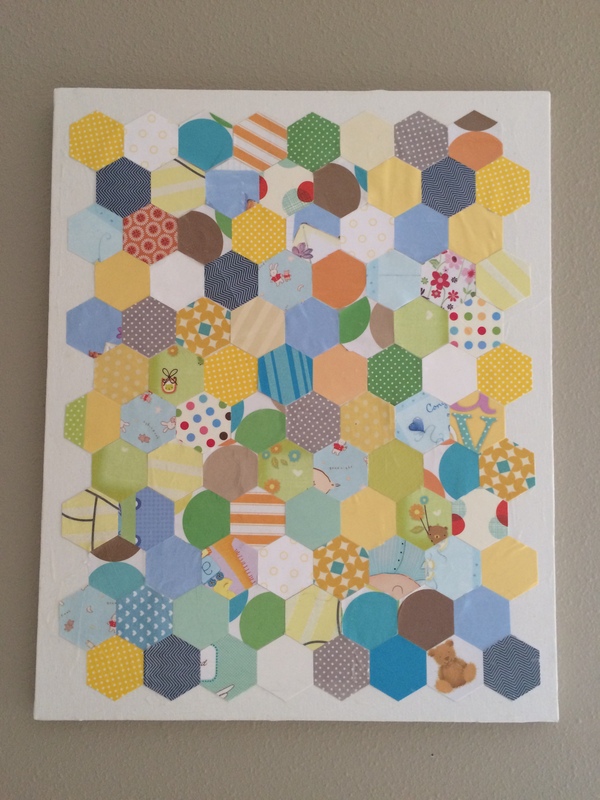 Fresh Nursery Wall Art Ideas: Decoupage, Glue, Sew and Staple – Odds & Hens : Ramblings. Creations. 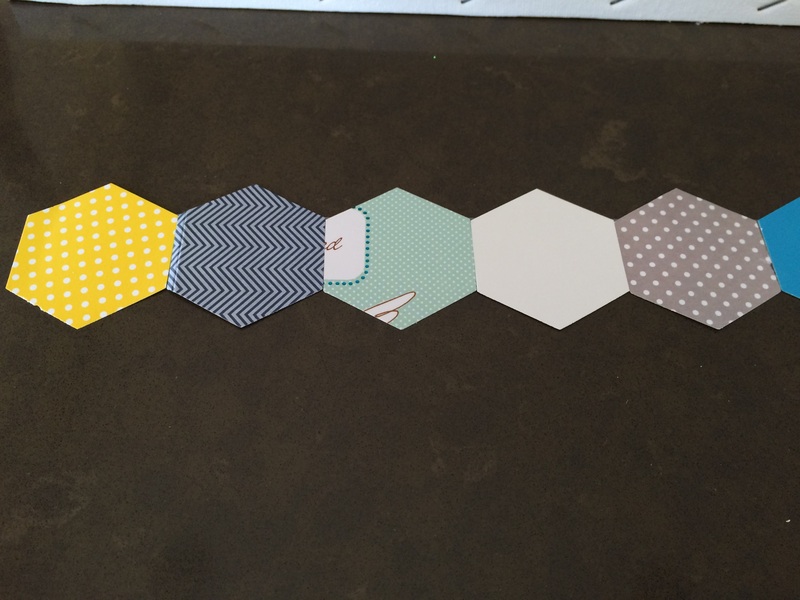 A share of easy and sometimes quick wall art crafts ideas I made for the little tot’s room. I shared a post where I made garland from greeting cards and gift bags [Here is that post!]. Well, I had quite a few left over…. so I cut more in coordinating colors, including gift bags, and then using a piece of scotch tab to line up and hold them, arranged them on a blank white canvas prepped with a fresh wet layer of modpodge and then applied a mod podge top coat. Hardest part? Letting it dry and not putting TOOOO much on as the paper will bubble. Another fun way to remember special events! Next is decoupaging fabric onto a canvas. The funky horned game bird (?) print, is part of the same series of gems I found years ago at a craft fair, but you could do this with any fabric or maybe a fun t-shirt, make your own prints using iron-on transfers or actual screen printing. 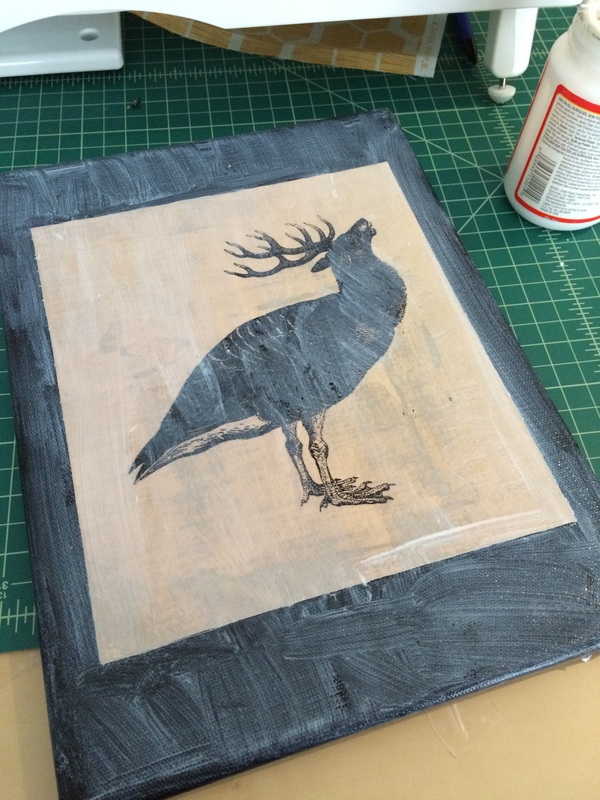 I love how after modpodging the black canvas shows through, giving it a slight antiqued look. From this same craft fair fabric treasure trove, I had a piece printed with a butterfly winged clock. I glued it to the back of a hexagon floating shelf, using blue tape to hold it tight, so the fabric is framed at the back of the shelf (below). These funky fabrics make appearances all around our house actually. 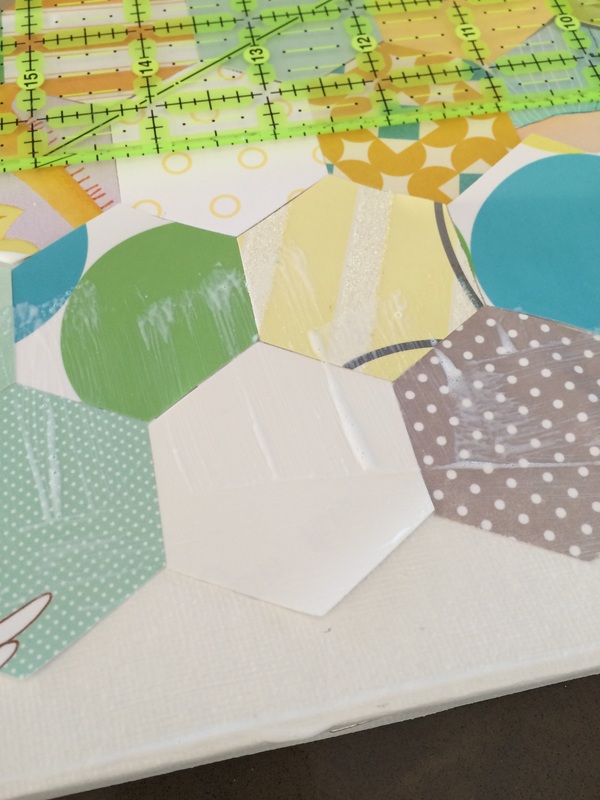 Another idea – I sewed some solid fabrics together in a large geometric shape and then glued to the back of some wood framed vintage filters -basically sheet metal with holes punched in it. 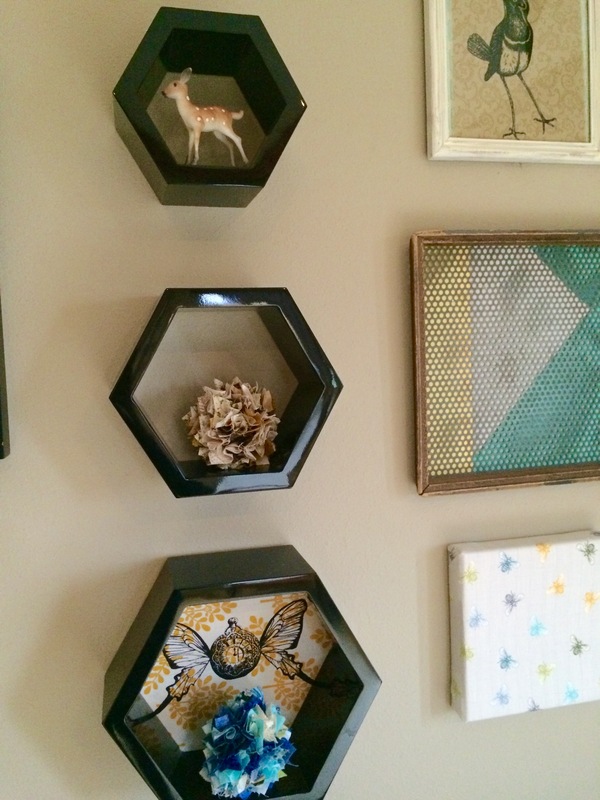 Finally – Always an quick, easy and not necessarily permanent way to decorate a room: stretch a fun fabric tightly over a canvas or put it in a frame (see the funky antler bird below). 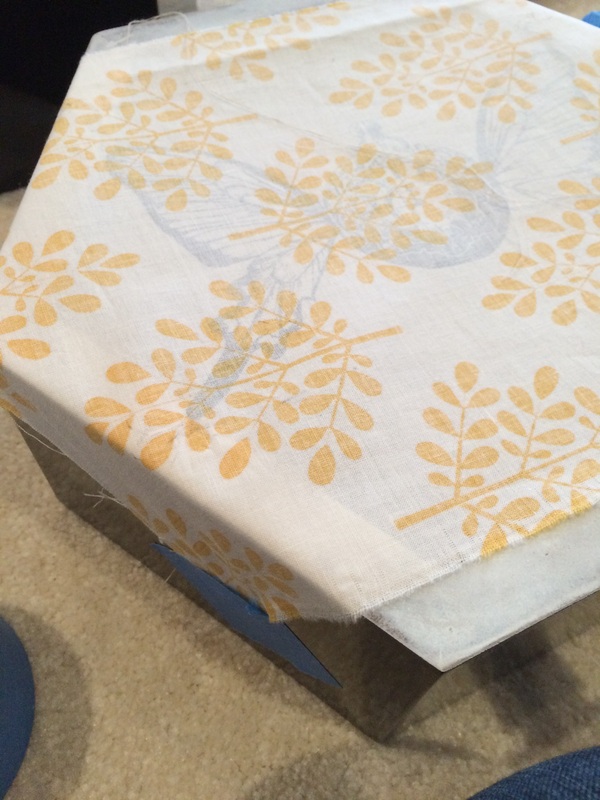 I used a staple gun to attached the fabric to some canvas with prints on them that I had around. When the fabric is lighter, you can add a layer of muslin or interfacing to block the canvas design from showing through. Dress up the fabric covered frames with ribbon, buttons, pictures etc. the fabric for the most part isn’t ruined nor is the printed canvas. If you were to look at the back you would see all the extra fabric. If you want you can add a hanger using brads and brackets. The scrappy fabric ‘orbs’ are from some holiday ornaments I made a few years ago. 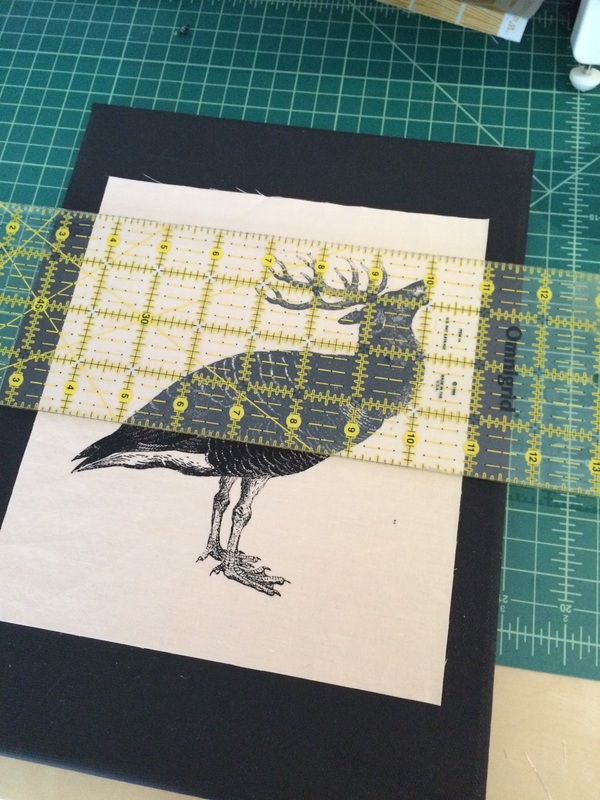 And the green deer letter press is a coaster I have been saving. What tips and ideas do you have?